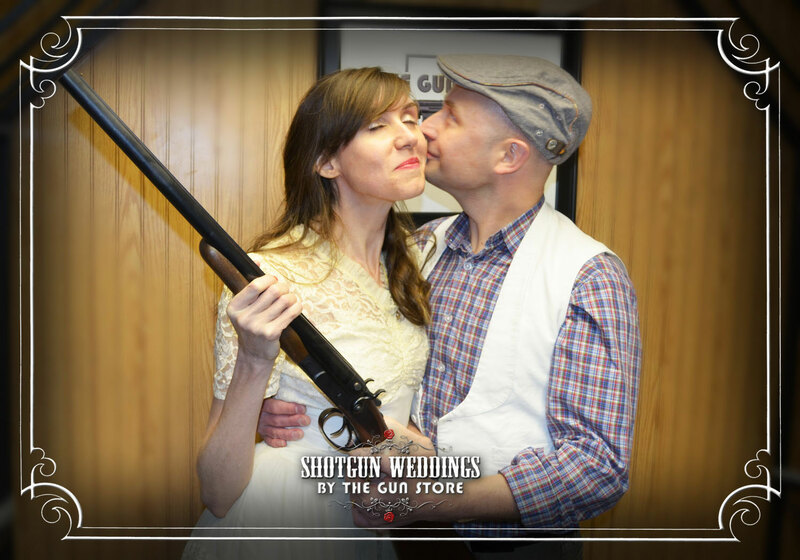 SHOTGUN WEDDINGS on our world-famous indoor shooting range. 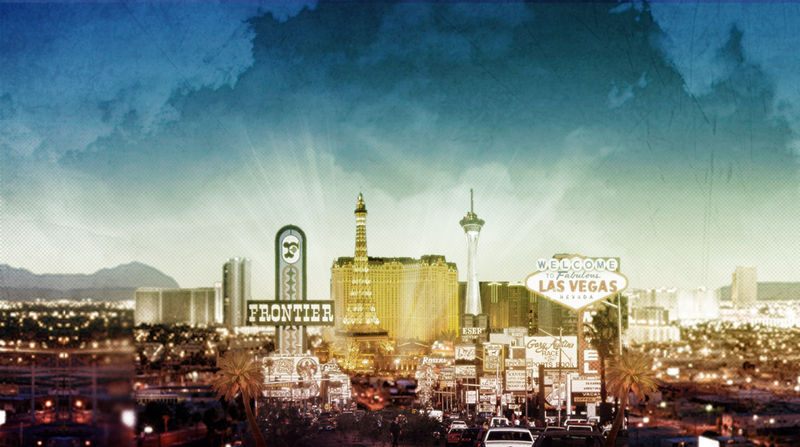 Celebrate Weddings, Vow Renewals & Commitment Ceremonies and shoot exotic firearms in Las Vegas. Our new Private VIP Ranges are now available to book your special and unique ceremony. 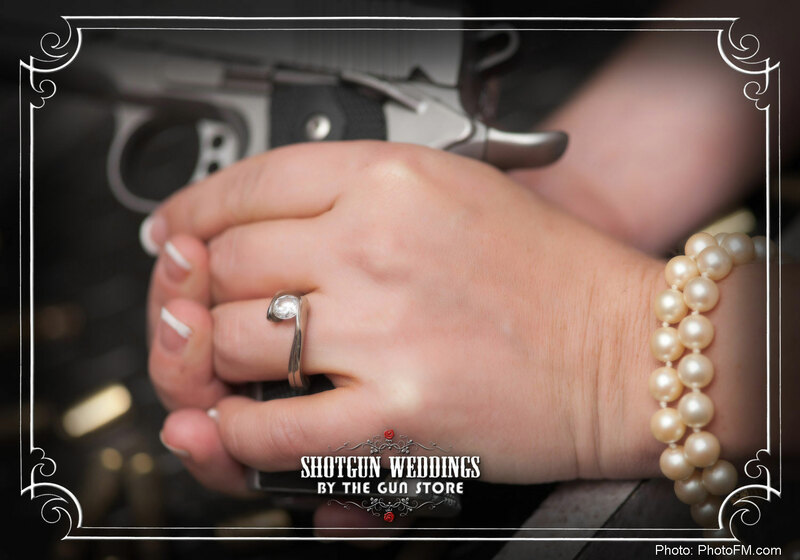 Preview videos and learn how to start planning your special ceremony at The Gun Store. 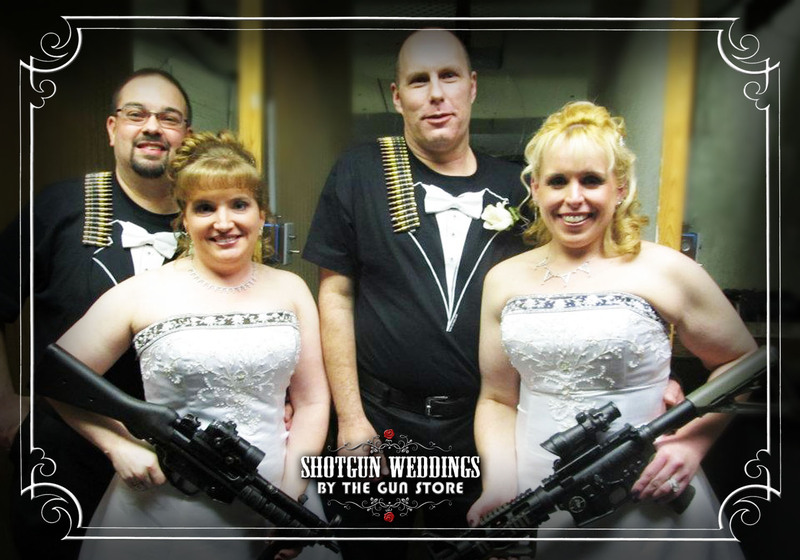 The Gun Store’s shotgun wedding service is just what you need to make your special day unique and unforgettable. 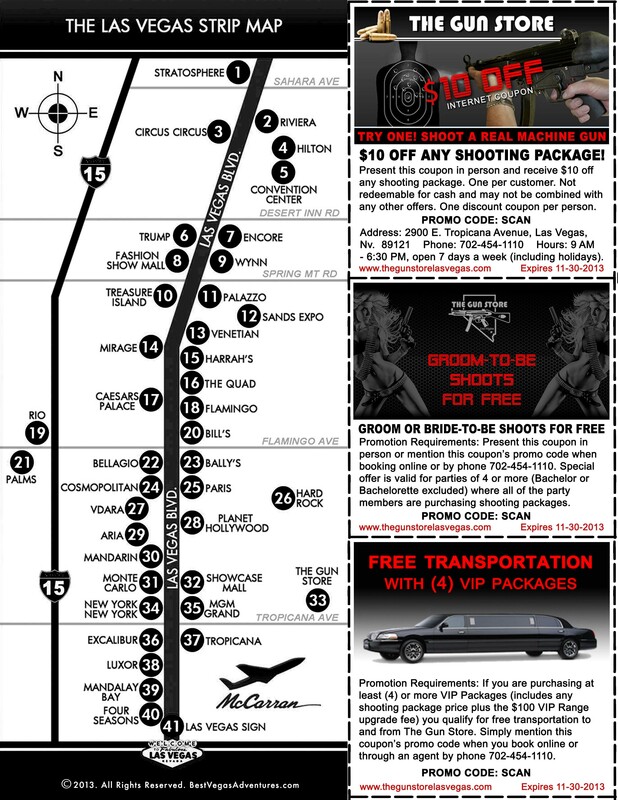 Nothing like a gun-themed wedding to move your Las Vegas experience a few notches higher! Multiple wedding and couples’ packages We have two ordained ministers (recognized by the state of Nevada and Clark County) on our staff – so, yes, you will be legally pronounced man and wife at our private VIP range. Our newly expanded indoor shooting range offers couples the space, exclusivity and privacy that are essential for weddings, vow renewals and commitment ceremonies. As part of our services, we will give you gift bags, five shots on a shotgun, custom hats, shirts and photo opportunities where you can pose with each gun you shoot! For couples who are gun-crazy, (or not) our Mr. & Mrs. Smith & Wesson package hits the spot. 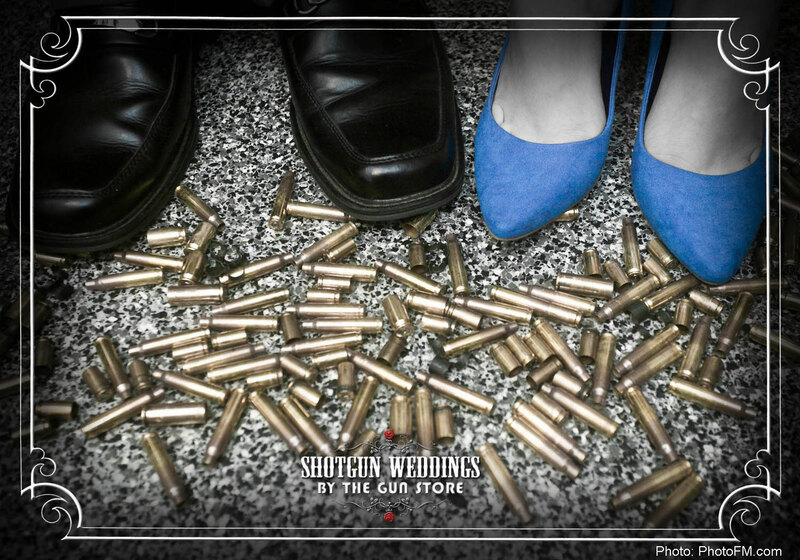 More guns, more ammunition and more targets translate into more enjoyment on your big day! 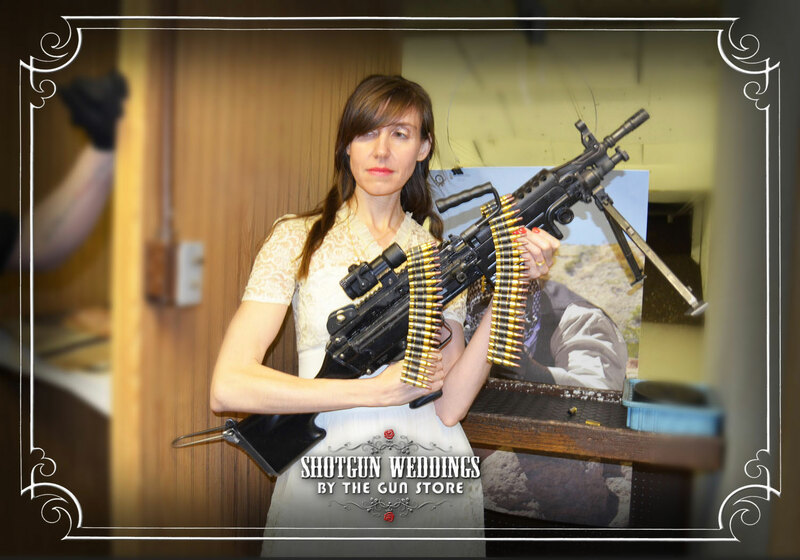 We are talking real shotguns and machine guns that you may have seen in movies or read about in the papers – a great chance to have an explosive wedding! We offer a variety of packages, which may include a selection of shooting adventures. A lot goes into planning the perfect wedding. We can make this easy for you with our range of additional services. Arrive at and leave your wedding ceremony in style with a luxury limo ride (champagne bottle is complimentary on the return trip after you complete your wedding). We can arrange for bridal bouquets, boutonnieres and all your floral needs. Preserve the memories of the day with our photography and videography services. They say a marriage is an adventure. We want you to start this adventure in the true sense of the word! If the thought of a Shotgun Wedding or vow renewal piques your interest, talk to us. Our wedding specialist can plan your special day completely in line with your wants and expectations. Shotgun Wedding anyone? 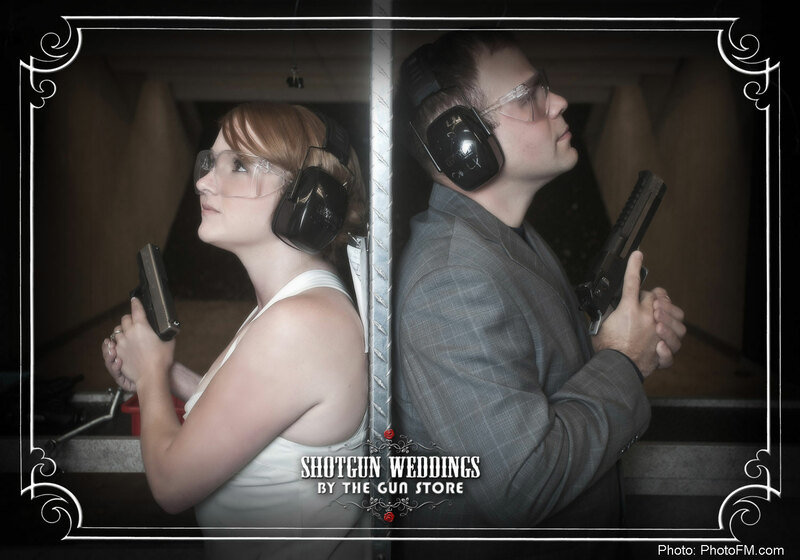 We have two ordained ministers on staff (recognized by the State of NV & Clark County) so you can have your dream gun-themed wedding in our VIP Range. Please complete the form below to plan your wedding in advance. 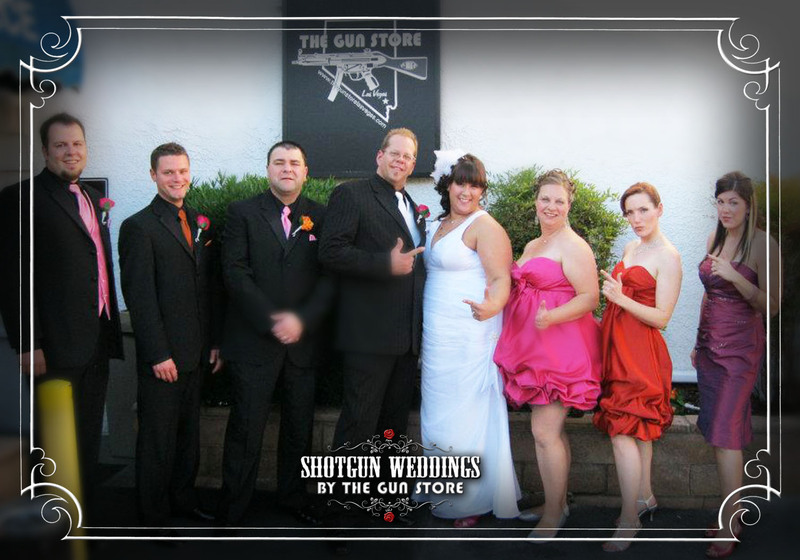 We look forward to having you celebrate your special day at The Gun Store Las Vegas! Scroll down to view packages available. *Please Note: Packages may vary. *Couples getting married need to bring their marriage licenses and Photo IDs with them to the ceremony. Click here for marriage license information.